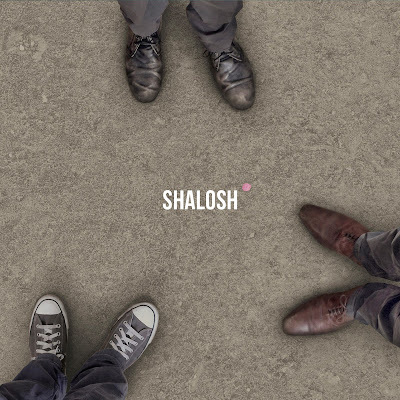 A staccato burst of power chords from the piano grabs the ear to launch this set by Israeli trio Shalosh. Pianist Gadi Stern returned to Israel from New York to rekindle a collaboration with old school friends bass player Daniel Benhorin and drummer Matan Assayang. The trio have popped up in UK recently at Lancaster Jazz Festival and the Spice of Life showcasing the result, this thoroughly contemporary trio album, blending all sorts of cultural and rhythmic references without obscuring strong melodies, catchy hooks and arresting grooves. The opener Computer Crash moves from those attention tweaking opening chords through inexorably looping sections that build to a climax before switching to a rocky riff or a contrasting section. It’s a compositional template they use liberally and the title and others like Brain Damaged Pumkin Pie hint at the energy and verve with which they are played. There's a big sprinkling of lyricism with finely crafted melodies. Leaving Maine's elegiac theme creates a powerful mood over gently rippling arpeggios before giving way to a lovely melodic bass solo. Eulogy's theme, doubled by piano and arco bass, unfolds over a march like tattoo from the drums. It's all beautifully played with moods and melodies allowed to develop and unfold gradually with repeating elements building intensity, the group dynamic as important as overt solo sections. There are a few surprises and a playful air at times. Everything Passes, Even the Trees develops a delicate melodic fragment into dramatic rolling arpeggios before bursting into poppy hook and a drum groove that wouldn’t sound out of place on 70s disco album. Gadi Stern’s piano is a fluent and expressive voice throughout but this is a distinctive set of originals from a trio that places as much emphasis on their collective sound as individual virtuosity with satisfying results.